Enlarge / The Stange Ice Shelf in Antarctica. One of the most shocking climate science studies in recent years came in 2016. That study, from David Pollard at Penn State and Rob DeConto at the University of Massachusetts, Amherst, showed that adding a couple physical processes to their model of the Antarctic ice sheets caused it to produce significantly more sea level rise this century. In their simulation, shrinking Arctic glaciers raised sea level by a full meter by 2100—and things only picked up from there. These simulations were much closer to hypotheses than to iron-clad predictions. The model showed these processes—the collapse of ice cliffs above a certain height and pressure-driven wedging apart of ice crevasses by meltwater—could make a huge difference. But such scenarios haven’t been studied well enough in the real world to know if the model was representing them well. Luckily, that task climbed the priority list after the work was published. A newly published study led by Tamsin Edwards at King’s College London first dove into DeConto's and Pollard’s simulations for some clarity. This team thought they had a better way of characterizing the range of results in the simulations to find the highest probability answers. They didn’t have the supercomputer time to repeat the simulations and add new ones, so instead they “emulated” the simulations by representing the existing ones with some statistics. That allows them to fill in the gaps between the limited number of simulations. The original study had applied a common method of varying the numbers for factors that aren’t precisely known, generating different model versions spanning the possibilities. They had then used those different versions to simulate different periods of sea level rise in the past. Versions that couldn’t match the past were thrown out before simulating the future. Edwards and her colleagues found that the selection process hinged strongly on the estimate of sea level rise used for the mid-Pliocene 3 million years ago—one of the comparison scenarios. Sea level from that time is hard to pin down, and the original study used “low” and “high” ranges of 5-15 meters higher than today or 10-20 meters higher. It turns out that there was a big difference between the model versions that matched the low range or the high range—with the latter simulating much more sea level rise in our future. Instead of splitting the Pliocene range in two, the new study decided to simplify it to one scenario. It also gave the model simulations a little more wiggle room in matching scenarios like this to be a little more realistic about how accurate the ice sheet models are expected to be. Similar to the first study, the model results were also checked against the last warm “interglacial” period about 120,000 years ago and against satellite observations going back to 1992. These slight tweaks—combined with the “emulation” method that fills in some gaps—provide a different perspective on the original model study. The researchers find that the ice-cliff-collapse process (which greatly increases future sea level rise projections) doesn’t necessarily improve the model’s fit to the comparison scenarios. About 55 percent of the model versions with the ice cliff process fit all three comparison scenarios, but so do 51 percent of the model versions without the new process. Looking at the range of future projections from all these model versions, the new study shows that the most common result is lower than the average result shown in the original study. Only a few model versions get up to that full meter of sea level rise by 2100. The most common result with the ice cliff process is about 45 centimeters (assuming no greenhouse gas emissions reductions). Without the new ice cliff physics, the most common result is about 15 centimeters—which is still higher than the estimated range given in the last IPCC report. Enlarge / Simulated sea level rise contribution from Antarctica by 2100. Solid red line is highest greenhouse gas emissions scenario. Light red bars show results of original 2016 study. Overall, the researchers hope this paints a clearer picture of what the DeConto and Pollard model was doing in 2016. It certainly highlights angles for future research, both comparing this with other ice sheet models and trying to study these added processes out on the ice. A second study published at the same time—and involving some of the same researchers but led by Victoria University of Wellington’s Nick Golledge—builds off similar modeling work to study the effects of all that melting ice pouring into the oceans. The global climate models used to project future warming have typically not attempted to simulate melting ice sheets, and this study sought to quantify what they might be missing. This ice sheet model used the warming from those global climate models to project ice loss from both Greenland and Antarctica, but then the team also used a separate climate model to simulate the consequences of the resultant glacial meltwater. Two results jumped out. First, the meltwater had a significant impact on Antarctica, causing even more glacial ice to melt. Adding fresh water—which is less dense than saltwater—to the ocean there slows the mixing of deep and shallow water. As a result, warmer water (a relative term in the Antarctic) gets trapped around the ice, boosting melt. This feedback process raises the total sea level rise contribution of Greenland and Antarctica from 16 centimeters to 25 centimeters. 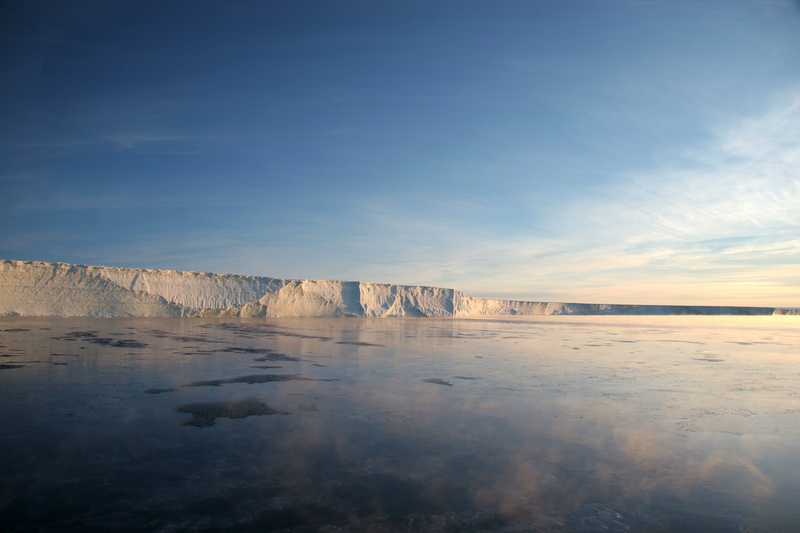 Second, Greenland’s meltwater had a larger effect on the climate than expected. Around Greenland, the Atlantic Ocean also mixes shallow and deep water—a key piece of the conveyor-belt-like circulation of the Atlantic. Here, too, freshwater would gum up the works and slow the conveyor belt. In this case, that can have a significant impact on the transport of warm surface water, affecting the surrounding climate. In their model, the Atlantic conveyor belt slows by about 15 percent by 2100. This is well short of the total halting of the conveyor depicted in the disaster film The Day After Tomorrow (which also gets the consequences of such a change completely wrong), but 15 percent is very significant. The change actually reduces the average global temperature by about 0.3° Celsius, but more importantly, it greatly increases the year-to-year variability of air and ocean temperatures in the region. That implies that global climate models can’t leave out this meltwater, as it could have a surprisingly large influence this century. So while it would be great comfort to rule out some of the worst-case scenarios for future sea level rise, lower sea level rise scenarios may carry more risk than initially thought. Nature, 2019. DOIs: 10.1038/s41586-019-0889-9, 10.1038/s41586-019-0901-4 (About DOIs).